I grew up learning all sorts of crafts. When I was a girl, a hundred years ago, it seemed like everyone learned how to embroidery, crochet, knit, etc.. At least in my small world they did. I love to knit but don’t always take the time to do so. As I was going through my bags of unfinished projects and found these little treasures. The pattern is called “Bead Knitted Pendant Bags”, but I make the handles a lot shorter and use them for gifts and Christmas ornaments. 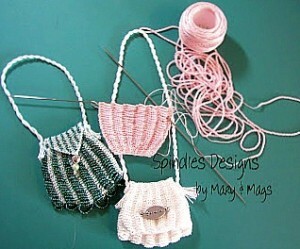 This great pattern is thanks to Theresa Williams, www.baglady.com. Knitters, they are real fun to make and just darn cute.